Government scientists and media shills are now "reexamining" old studies that show that radioactive substances like plutonium cause cancer and arguing that exposure to low doses of radiation is good for us (a theory called "hormesis"). It is not just bubbleheads like Ann Coulter and pro-nuclear hacks like Lawrence Solomon are saying it as well. In virtually every discussion on the risk of nuclear radiation, someone post comments arguing that a little radiation makes us healthier. Consensus reports by the United States National Research Council and the National Council on Radiation Protection and Measurements and the United Nations Scientific Committee on the Effects of Atomic Radiation (UNSCEAR) have upheld that insufficient human data on radiation hormesis exists to supplant the Linear no-threshold model (LNT). Therefore, the LNT continues to be the model generally used by regulatory agencies for human radiation exposure. The notion of radiation hormesis has been rejected by the National Research Council's (part of the National Academy of Sciences) 16 year long study on the Biological Effects of Ionizing Radiation. "The scientific research base shows that there is no threshold of exposure below which low levels of ionizing radiation can be demonstrated to be harmless or beneficial. See this, this, this and this. Most proponents of the hormesis theory claim that data from the residents of Nagasaki and Hiroshima shows that residents exposed to low levels of radiation (i.e. some miles from the bomb blasts) lived longer than residents who lived so far away that they were not exposed to any radiation. Japanese survivors of the atomic bomb have their life expectancy reduced by an average about 4 months, which does not support claims that survivors exposed to low levels of radiation live longer than comparable unexposed individuals. To clarify the question of whether atomic bomb survivors have enhanced or reduced life expectancy, Drs. John B. Cologne and Dale L. Preston from the Radiation Effects Research Foundation, Hiroshima, Japan, studied 120,321 survivors and estimated their radiation exposure and mortality rates after 45 years of follow up. They report in the July 22nd issue of The Lancet that median life expectancy fell by about 1.3 years per Gy of estimated radiation dose, and declined faster at higher doses. At doses below 1 Gy, median life expectancy fell by about 2 months, while exposures of greater than 1 Gy resulted in a median loss of life of 2.6 years. Drs. Cologne and Preston estimate that at a dose of 1 Gy, 60% of those exposed died from solid cancer, 30% from illnesses other than cancer, and 10% from leukemia. "These results are important in light of the recent finding that radiation significantly increases mortality rates for causes other than cancer," they write. In popular treatments of radiation hormesis, a study of the inhabitants of apartment buildings in Taiwan has received prominent attention. The building materials had been accidentally contaminated with Cobalt-60 but the study found cancer mortality rates more than 20 times lower than in the population as a whole. However, this study compared the relatively young irradiated population with the much older general population of Taiwan, which is a major flaw. A subsequent study by Hwang et al. (2006) found a significant exposure-dependent increase in cancer in the irradiated population, particularly leukemia in men and thyroid cancer in women, though this trend is only detected amongst those who were first exposed before the age of 30. This study also found that rate of total cancer cases was lower than expected. Even if the accepted scientific consensus is wrong and hormesis is real, we're getting too much of a good thing. Small amounts of caesium-134 and caesium-137 were released into the environment during nearly all nuclear weapon tests and some nuclear accidents, most notably the Chernobyl disaster. As of 2005, caesium-137 is the principal source of radiation in the zone of alienation around the Chernobyl nuclear power plant. Together with caesium-134, iodine-131, and strontium-90, caesium-137 was among the isotopes with greatest health impact distributed by the reactor explosion. The mean contamination of caesium-137 in Germany following the Chernobyl disaster was 2000 to 4000 Bq/m2. This corresponds to a contamination of 1 mg/km2 of caesium-137, totaling about 500 grams deposited over all of Germany.Caesium-137 is unique in that it is totally anthropogenic. Unlike most other radioisotopes, caesium-137 is not produced from its non-radioactive isotope, but from uranium. It did not occur in nature before nuclear weapons testing began. By observing the characteristic gamma rays emitted by this isotope, it is possible to determine whether the contents of a given sealed container were made before or after the advent of atomic bomb explosions. This procedure has been used by researchers to check the authenticity of certain rare wines, most notably the purported "Jefferson bottles". Cesium-133 is the only naturally occurring isotope and is non-radioactive; all other isotopes, including cesium-137, are produced by human activity. So there was no "background radiation" for caesium-137 before above-ground nuclear testing and nuclear accidents such as Chernobyl. Essentially all the plutonium on earth has been created within the past six decades by human activities involving fissionable materials. Atmospheric testing of nuclear weapons, which ceased worldwide by 1980, generated most environmental plutonium. About 10,000 kg were released to the atmosphere during these tests. Average plutonium levels in surface soil from fallout range from about 0.01 to 0.1 picocurie per gram (pCi/g). Accidents and other releases from weapons production facilities have caused greater localized contamination. So like radioactive cesium and iodide - which I discussed yesterday - plutonium doesn't exist in nature in any significant quantity, and so "background radiation" is a meaningless concept. In other words, even if a little radiation is good for us, we have already been getting exposed to a lot more radiation - from nuclear weapons tests, Chernobyl, Japan and other sources - than our ancestors were ever exposed to. Indeed, even if the studies did show that low level exposure by the survivors of Hiroshima and Nagasaki helped them live longer, background radiation in 1945 was much lower than after above-ground nuclear tests, Chernobyl and Fukushima. It's not only apologists for the safety-averse nuclear power industry which is trying to convince us of hormesis. Apologists for all big polluters are arguing hormesis as well. Hormesis ... is the term for generally favorable biological responses to low exposures to toxins and other stressors. Even if radiation hormesis is true, we are exposed to a wide range of toxic chemicals, including BPA in our cans, rocket fuel in our drinking water, mercury in our fish, and many others. The combined effect of the substances acting together is greater than the sum of the effects of the substances acting by themselves . For example, smokers are much more likely to get cancer from exposure to radioactive radon gas than non-smokers. So even if there is hormesis from a chemical at low doses (hormesis promoters claim that low level exposures cause our body to produce a wave of antioxidants and other cancer-fighters), by the time we get swamped with the myriad of toxic chemicals and radiation exposures present in modern life, our body's defense mechanisms become so overextended that any hormesis effect is lost. The bottom line: Some more radiation from Japan or a new nuclear power plant will not be good for us. During exposure to low-level doses (LLD) of ionizing radiation (IR), the most of harmful effects are produced indirectly, through radiolysis of water and formation of reactive oxygen species (ROS). The antioxidant enzymes - superoxide dismutase (SOD): manganese SOD (MnSOD) and copper-zinc SOD (CuZnSOD), as well as glutathione (GSH), are the most important intracellular antioxidants in the metabolism of ROS. Overproduction of ROS challenges antioxidant enzymes. Chronic exposure to low-dose radiation doses could be much more harmful than high, short-term doses because of lipid peroxidation initiated by free radicals. Peroxidation of cell membranes increases with decreasing dose rate (Petkau effect). Countering free radicals is therefore one of the most important ways we can help protect ourselves from the effects of low-level radiation from Japan, from Chernobyl and elsewhere. Can Vitamins or Herbs Help Protect Us from Radiation? What Foods Are Highest in Antioxidants? Some Inexpensive Foods Are Higher In Antioxidants than the Newest Pricey "Superfoods"
Note: The Bulletin of Atomic Scientists reported that one of the best-known scientists of the 20th century - Dr. John Gofman - also believed that chronic low level radiation is more dangerous than acute exposure to high doses. Gofman was a doctor of nuclear and physical chemistry and a medical doctor who worked on the Manhattan Project, co-discovered uranium-232 and -233 and other radioactive isotopes and proved their fissionability, helped discover how to extract plutonium, led the team that discovered and characterized lipoproteins in the causation of heart disease, served as a Professor Emeritus of Molecular and Cell Biology at the University of California Berkeley, served as Associate Director of the Livermore National Laboratory, was asked by the Atomic Energy Commission to undertake a series of long range studies on potential dangers that might arise from the "peaceful uses of the atom", and wrote four scholarly books on radiation health effects. But whether or not chronic, low doses of radiation cause more or less damage than acute, higher doses is beyond the scope of this article. The point is that they both can cause damage. Disclaimer: I am not a health care professional. It is well known that excessive leverage was one of the primary causes of the Great Depression. Specifically, many people bought stocks on margin, and when stock prices dropped, they were wiped out and their lenders got hit hard. Between 1880 and 1960 bank leverage was – on average – about half the level of recent decades. Bank leverage has been on an upwards trend for 100 years; the average growth of the economy has shown no obvious trend. The Securities and Exchange Commission can blame itself for the current crisis. That is the allegation being made by a former SEC official, Lee Pickard, who says a rule change in 2004 led to the failure of Lehman Brothers, Bear Stearns, and Merrill Lynch. Making matters worse, according to Mr. Pickard, who helped write the original rule in 1975 as director of the SEC's trading and markets division, is a move by the SEC this month to further erode the restraints on surviving broker-dealers by withdrawing requirements that they maintain a certain level of rating from the ratings agencies. "They constructed a mechanism that simply didn't work," Mr. Pickard said. "The proof is in the pudding — three of the five broker-dealers have blown up." The so-called net capital rule was created in 1975 to allow the SEC to oversee broker-dealers, or companies that trade securities for customers as well as their own accounts. It requires that firms value all of their tradable assets at market prices, and then it applies a haircut, or a discount, to account for the assets' market risk. So equities, for example, have a haircut of 15%, while a 30-year Treasury bill, because it is less risky, has a 6% haircut. The net capital rule also requires that broker dealers limit their debt-to-net capital ratio to 12-to-1, although they must issue an early warning if they begin approaching this limit, and are forced to stop trading if they exceed it, so broker dealers often keep their debt-to-net capital ratios much lower. Housing policies alone, however, would not have led to the near insolvency of many banks and to the credit-market freeze. The key to these effects was the excessive leverage that pervaded, and continues to pervade, the financial industry. The [Financial Crisis Inquiry Commission] reports mention this, but they fail to point out how government policies created incentives for leverage, and how the government failed to control it before and during the crisis. Excessive leverage is a source of great fragility. It increases the chances that an institution goes into distress, which interferes with credit provision. And, particularly in the presence of any guarantees, high leverage encourages excessive risk taking. We must focus on developing a healthier system with better incentives, being mindful of unavoidable frictions and constraints. Addressing excessive leverage and controlling the ability to use growth and risk to take advantage of guarantees should be the first and most critical step. The New York Federal published a report in July entitled "The Shadow Banking System: Implications for Financial Regulation". Securitization was intended as a way to transfer credit risk to those better able to absorb losses, but instead it increased the fragility of the entire financial system by allowing banks and other intermediaries to “leverage up” by buying one another’s securities. In the new, post-crisis financial system, the role of securitization will likely be held in check by more stringent financial regulation and by the recognition that it is important to prevent excessive leverage and maturity mismatch, both of which can undermine financial stability. On Friday, William Dudley, President of FRBNY, gave an excellent presentation on the financial crisis. The speech was a logically-structured, tightly-reasoned, and succinct retrospective of the crisis. It took one step back from the details and proved a very useful financial sector-wide perspective. The speech should be read by everyone with an interest in the crisis. It highlights the often overlooked role of leverage and maturity mismatches even as its stated purpose was examining the role of liquidity. In fact, every independent economist has said that too much leverage was one of the main causes of the current economic crisis. Federal Reserve Bank of San Francisco President Janet Yellen said today it’s “far from clear” whether the Fed should use interest rates to stem a surge in financial leverage, and urged further research into the issue.“Higher rates than called for based on purely macroeconomic conditions may help forestall a potentially damaging buildup of leverage and an asset-price boom,” Yellen said in the text of a speech today in Hong Kong. As you know, excessive leverage was a key component of the financial crisis. Investment banks leveraged their balance sheets to stratospheric levels by using short-term wholesale financing (like repurchase agreements and commercial paper). Meanwhile, some entities regulated as bank holding companies (BHCs) used off-balance-sheet entities to warehouse risky assets, thereby evading their regulatory capital requirements. These entities’ reliance on short-term debt to fund the purchase of oftentimes illiquid and risky assets made them susceptible to a classic bank panic. The key difference was that this panic wasn’t a run on deposits by scared individuals, but a run on collateral by sophisticated counterparties. The Board's authority and flexibility in establishing capital requirements, including leverage requirements, have been key to the Board's ability to require additional capital where needed based on a banking organization's risk profile. We note that in other contexts, statutorily prescribed minimum leverage ratios have not necessarily served prudential regulators of financial institutions well. The current authority and flexibility the Board has to establish and modify leverage ratios as a banking organization regulator is very important to the successful participation of the Board in the process of establishing and calibrating an international leverage ratio. In reality, the Fed has been one the biggest enablers for increased leverage. As anyone who has looked at Bernanke and Geithner's actions will tell you, many of the government's programs are aimed at trying to re-start securitization and the "shadow banking system", and to prop up asset prices for highly-leveraged financial products. In an effort to restart securitization markets to support the extension of credit to consumers and small businesses, we joined with the Treasury to announce the Term Asset-Backed Securities Loan Facility (TALF). The Term Asset-Backed Securities Loan Facility, or TALF ... has helped restart the securitization markets for various types of consumer and small business credit. Securitization markets are an important source of credit, and their virtual shutdown during the crisis has reduced credit availability for many borrowers. The Fed talking about reducing leverage is like a crack cocaine dealer handing out "just say no" stickers. Nor does it exonerate the watchdogs. "How could such a huge shadow banking system emerge without provoking clear statements of official concern?" "The fundamental cause of today's emerging problems was excessive and imprudent credit growth over a long period. Policy interest rates in the advanced industrial countries have been unusually low," [White] said. "Should governments feel it necessary to take direct actions to alleviate debt burdens, it is crucial that they understand one thing beforehand. If asset prices are unrealistically high, they must fall. If savings rates are unrealistically low, they must rise. If debts cannot be serviced, they must be written off. "To deny this through the use of gimmicks and palliatives will only make things worse in the end," he said. In January 2005, the BIS's Committee on the Global Financial System sounded the alarm once again, noting that the risks associated with structured financial products were not being "fully appreciated by market participants." Extreme market events, the experts argued, could "have unanticipated systemic consequences". Central banks [including the Fed] failed to address risks building in the new economy. They seemingly mastered product price inflation in the 1980s, but most decided that asset price bubbles were difficult to identify and to restrain with monetary policy. They argued that damage to the 'real economy' of jobs, production, savings, and consumption could be contained once bubbles burst, through aggressive easing of interest rates. They turned out to be wrong. Remember also that Greenspan acted as one of the main supporters of derivatives (including credit default swaps) between the late 1990's and the present (and see this). Greenspan was also one of the main cheerleaders for subprime loans (and see this). Both increased leverage, especially since the shadow banking system - CDOs, CDSs, etc. - were largely stacked on top of the subprime mortgages. In fact, as I've repeatedly pointed out, Bernanke (like [all of the government economic leaders]), is too wedded to an overly-leveraged, highly-securitized, derivatives-based, bubble-blown financial system. His main strategy, arguably, is to re-lever up the financial system. The Fed may be talking like Smokey the Bear, but it continues to hand out matches trying to increase leverage. If reserve requirements are eliminated, or even significantly reduced, banks could hypothetically loan out hundreds of times their reserves, subjecting them - and the entire economy - to gargantuan risks. Gallup Poll Shows that More Americans Believe the U.S. is in a Depression than is Growing ... Are They Right? Consumer confidence is, well ... in somewhat of a depression. The April 20-23 Gallup survey of 1,013 U.S. adults found that only 27 percent said the economy is growing. Twenty-nine percent said the economy is in a depression and 26 percent said it is in a recession, with another 16 percent saying it is "slowing down," Gallup said. That means that more Americans think the country is in a Depression, let alone recession, than growing. How can so many Americans believe that we're in a depression, when the stock market and commodity prices have been booming? Instead of directly helping the American people, the government threw trillions at the giant banks (including foreign banks; and see this) . The big banks have - in turn - used a lot of that money to speculate in commodities, including food and other items which are now driving up the price of consumer necessities [as well as stocks]. Instead of using the money to hire Americans, they're hiring abroad (and getting tax refunds from the government). But don't rising stock prices help create wealth? A rising stock market doesn't help the average American as much as you might assume. We have examined the wealth effect with a cross-sectional time-series data sets that are more comprehensive than any applied to the wealth effect before and with a number of different econometric specifications. The statistical results are variable depending on econometric specification, and so any conclusion must be tentative. Nevertheless, the evidence of a stock market wealth effect is weak; the common presumption that there is strong evidence for the wealth effect is not supported in our results. However, we do find strong evidence that variations in housing market wealth have important effects upon consumption. This evidence arises consistently using panels of U.S. states and individual countries and is robust to differences in model specification. The housing market appears to be more important than the stock market in influencing consumption in developed countries. Even Alan Greenspan recently called the recovery "extremely unbalanced," driven largely by high earners benefiting from recovering stock markets and large corporations. Some cheerleaders say rising stock prices make consumers feel wealthier and therefore readier to spend. But to the extent most Americans have any assets at all their net worth is mostly in their homes, and those homes are still worth less than they were in 2007. The "wealth effect" is relevant mainly to the richest 10 percent of Americans, most of whose net worth is in stocks and bonds. As of 2007, the bottom 50% of the U.S. population owned only one-half of one percent of all stocks, bonds and mutual funds in the U.S. On the other hand, the top 1% owned owned 50.9%. Indeed, most stocks are held for only a couple of moments - and aren't held by mom and pop investors. How bad are things for the little guy? Well, as I noted in January, the housing slump is worse than during the Great Depression. Wal-Mart's core shoppers are running out of money much faster than a year ago due to rising gasoline prices, and the retail giant is worried, CEO Mike Duke said Wednesday. "We're seeing core consumers under a lot of pressure," Duke said at an event in New York. "There's no doubt that rising fuel prices are having an impact." Lately, they're "running out of money" at a faster clip, he said. "Purchases are really dropping off by the end of the month even more than last year," Duke said. "This end-of-month [purchases] cycle is growing to be a concern. Things haven't been this bad for state and local governments since the 30s. Citing what it calls "an unprecedented rise" in long-term unemployment, the federal Bureau of Labor Statistics (BLS), beginning Saturday, will raise from two years to five years the upper limit on how long someone can be listed as having been jobless. The change is a sign that bureau officials "are afraid that a cap of two years may be 'understating the true average duration' — but they won't know by how much until they raise the upper limit," says Linda Barrington, an economist who directs the Institute for Compensation Studies at Cornell University's School of Industrial and Labor Relations. "The BLS doesn't make such changes lightly," Barrington says. Stacey Standish, a bureau assistant press officer, says the two-year limit has been used for 33 years. Although "this feels like something we've not experienced" since the Great Depression, she says, economists need more information to be sure. It is difficult to compare current unemployment with that during the Great Depression. In the Depression, unemployment numbers weren't tracked very consistently, and the U-3 and U-6 statistics we use today weren't used back then. And statistical "adjustments" such as the "birth-death model" are being used today that weren't used in the 1930s. But let's discuss the facts we do know. The average length of unemployment is higher than it's been since government began tracking the data in 1948. The Christian Science Monitor wrote an article in June entitled, "Length of unemployment reaches Great Depression levels". Pulitzer Prize-winning historian David M. Kennedy notes in Freedom From Fear: The American People in Depression and War, 1929-1945 (Oxford, 1999) that - during Herbert Hoover's presidency, more than 13 million Americans lost their jobs. Of those, 62% found themselves out of work for longer than a year; 44% longer than two years; 24% longer than three years; and 11% longer than four years. I don't know. But the number of people unemployed will be higher than during the Depression. Unemployment is expected to exceed 10% by many economists, and Obama "has warned that the unemployment rate will explode to at least 10% in 2009". 10 percent of 154 million is 15 million people out of work - more than during the Great Depression. No wonder Chris Tilly - director of the Institute for Research on Labor and Employment at UCLA - says that African-Americans and high school dropouts are experiencing depression-level unemployment. 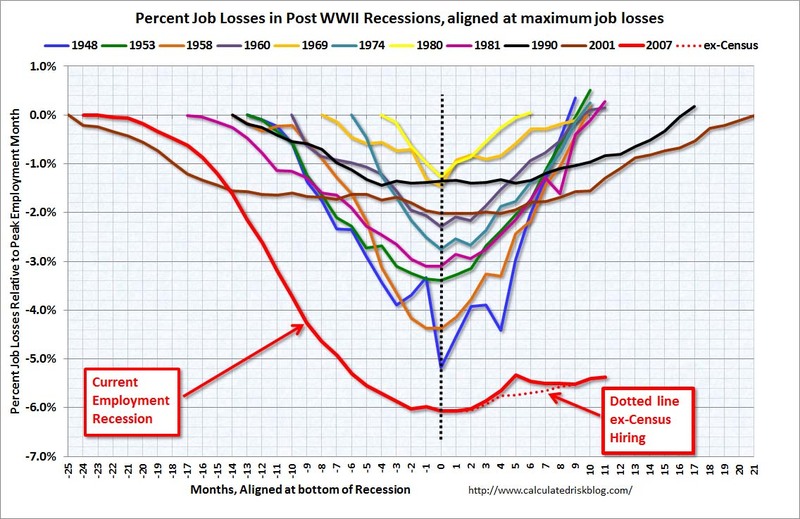 The bottom line is that it is difficult to compare current unemployment with what occurred during the Great Depression. In some ways things seem better now. In other ways, they don't. Factors like where you live, race, income and age greatly effect one's experience of the severity of unemployment in America. While we don't see soup kitchens, it may only be because so many Americans are receiving food stamps. Indeed, despite the dramatic photographs we've all seen of the 1930s, the 43 million Americans relying on food stamps to get by may actually be much greater than the number who relied on soup kitchens during the Great Depression. In addition, according to Chaz Valenza (a small business owner in New Jersey who earned his MBA from New York University's Stern School of Business) millions of Americans are heading to foodbanks for the first time in their lives. Given the above facts, it would seem that the government hasn't been doing much. But the scary thing is that the government has done more than during the Great Depression, but the economy is still stuck a pit. The amount spent in emergency bailouts, loans and subsidies during this financial crisis arguably dwarfs the amount which the government spent during the New Deal. Paulson and Bernanke have embarked on the largest bailout program ever conceived .... a program which so far will cost taxpayers $8.5 trillion. So even though the government's spending on the "war" on the economic crisis dwarfs the amount spent on the New Deal, our economy is still stuck in the mud. Why Haven't Things Gotten Better for the Little Guy? Government leaders make happy talk about how things are improving, but happy talk cannot fix the economy. There are, of course, other reasons the economy is still stuck in a ditch for most Americans, such as encouraging too much leverage, bailing out the big speculators, failing to break up the mammoth banks, and failing to spend wisely, where it will do some good. See this and this. But fraud and inequality were core causes of the Depression, and our failure to address them will only prolong our misery. A large, violent tornado has come through Tuscaloosa. It was reported to be a mile wide, and came from the southwest. Severe storms and tornadoes moving through the U.S. Southeast dealt a severe blow to the Tennessee Valley Authority on Wednesday, causing three nuclear reactors in Alabama to shut and knocking out 11 high-voltage power lines, the utility and regulators said. All three units at TVA's 3,274-megawatt Browns Ferry nuclear plant in Alabama tripped about 5:30 EDT (2230 GMT) after losing outside power to the plant, a spokesman for the U.S. Nuclear Regulatory Commission said. A TVA spokeswoman said the station's backup power systems, including diesel generators, started and operated as designed. External power was restored quickly to the plant but diesel generators remained running Wednesday evening, she said. The Browns Ferry units are among 23 U.S. reactors that are similar in design to the crippled Fukushima Daiichi nuclear plant in Japan where backup generators were swept away in the tsunami that followed the massive earthquake on March 11. At Browns Ferry, a plant with the same design as Fukushima-Dai-ichi in Japan, more than 1,415 metric tons of spent fuel and rods lie in three pools on a massive concrete pad above the plant’s three reactors. All that encloses the pools is a heavy garage like metal roof and walls. In contrast, reports on the amount of fresh and spent fuel together at all 6 Fukushima reactors is somewhere between 1,760 and 4,277 metric tons. In other words, when the fuel within the reactors is included, Browns Ferry may have almost as much radioactive fuel in its 3 reactors as are contained in all Fukushima's 6 reactors. Browns Ferry is built along the New Madrid fault and thus designed to withstand some degree of an earthquake. A tornado or a ravaging flood could just as easily be like the tsunami that unleashed the final blow. Energy officials should re-evaluate nuclear plant designs and build in plenty of redundancies for worst-case scenarios. Internal Nuclear Regulatory Commission e-mails and memos obtained by the Union of Concerned Scientists questioned the adequacy of the back-up plans to keep reactor cooling systems running if off-site power were lost for an extended period. And Browns Ferry almost melted down in 1975. Thankfully, there haven't been any reports of radiation leakage, and - since the diesel generators are working - there shouldn't be any problems in the near future. But this is yet another reminder that many nuclear power plants are built with outdated designs and maintained in an unsafe, penny-pinching manner, and are very vulnerable to natural disasters or mischief. Will we allow a nuclear black swan to happen in America ... which could be even worse than Japan? Or will we be smart enough to tackle this problem now, while we still can? Has the Fed Decided to Fight Inflation Instead of Unemployment? Bernanke's argument about inflation isn't consistent, economist Paul Krugman says. The Fed's asset-purchase strategy is partially intended to promote maximum unemployment, but some experts are concerned that it will ultimately spark inflation once the recovery takes hold and the system remains awash in liquidity. In this view, there's a tradeoff between jobs and prices. Bernanke, however, doesn't take this view: He said in the press conference that core inflation, or, as Krugman says, "inflation inertia," isn't a concern -- and that expansionary monetary policy doesn't stoke these forces. This doesn’t make any sense in terms of his own expressed economic framework. I think the only way to read it is to say that he has been intimidated by the inflationistas, and is looking for excuses not to act. 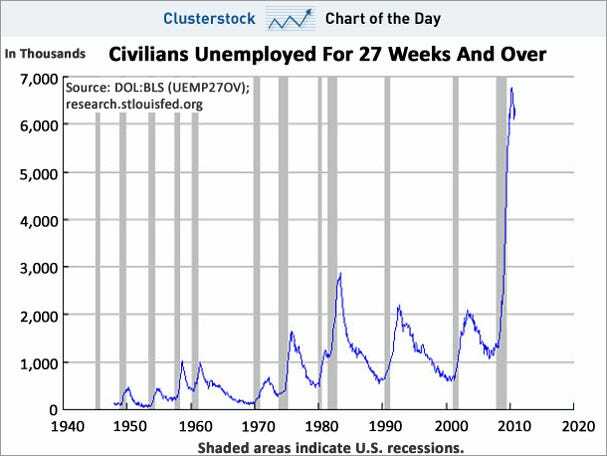 The country now has almost 25 million people who are unemployed or underemployed as a result of the Fed's disastrous policies. Millions of people are losing their homes and tens of millions are losing their life savings. The country is likely to lose more than $6 trillion in output ($20,000 per person) due to the Fed's inept job performance. The Fed could have stemmed the unemployment crisis by demanding that banks lend more as a condition to the various government assistance programs, but Mr. Bernanke failed to do so. The Fed is mandated by law to maximize employment, but focuses on inflation -- and "expected inflation" -- at the expense of job creation. At its most recent meeting, board members bluntly stated that they feared banks might increase lending, which they worried could lead to inflation. Suffering high unemployment in order to keep inflation low cuts against the Fed's legal mandate. Or, to put it more bluntly, it may be illegal. In fact, the unemployment situation is getting worse, and many leading economists say that - under Mr. Bernanke's leadership - America is suffering a permanent destruction of jobs. Given that the law mandates that the Fed maximize employment, but that unemployment is instead becoming catastrophic under Mr. Bernanke's watch, how can Mr. Bernanke justify his actions to date? Ben Bernanke has said that the Fed is trying to promote inflation, increase lending, reduce unemployment, and stimulate the economy. However, the Fed has ... been working against all of these goals. Whatever your take, a robust job recovery this is not. All in all, this is an economy crying out for more stimulus, wherever you can get it. We don't need more stimulus ... at least not the kind we've had to date, which has only stimulated bonuses for the big banksters and big defense contractors. Today, however, Bernanke ... and the rest of the boys haven't fixed any of the major structural defects in the economy. So even if Keynesianism were the answer, it cannot work without the implementation of structural reforms to the financial system. A little extra water in the plumbing can't fix pipes that have been corroded and are thoroughly rotten. The government hasn't even tried to replace the leaking sections of pipe in our economy. In truth and in fact, the government's policies are not only not working to stem the rising tide of unemployment, they are making it worse. Forget the whole "Keynesian" versus "deficit hawk" debate. The real debate is between good and bad policy. The government has committed to give trillions to the financial industry. President Obama's stimulus bill was $787 billion, which is less than a tenth of the money pledged to the banks and the financial system. Of the $787 billion, little more than perhaps 10% has been spent as of this writing. The Government Accountability Office says that the $787 billion stimulus package is not being used for stimulus. Instead, the states are in such dire financial straights that the stimulus money is instead being used to "cushion" state budgets, prevent teacher layoffs, make more Medicaid payments and head off other fiscal problems. So even the money which is actually earmarked to help the states stimulate their economies is not being used for that purpose. Indeed, much of the $787 billion was earmarked pork, not for anything which could actually stimulate the economy. 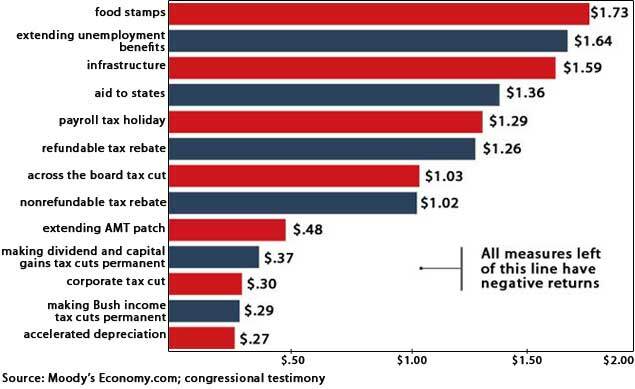 But very little of the stimulus funds are actually going to high-value stimulus projects. Critics say the [stimulus money reaching California] is being used for projects that would have been built anyway, instead of on ways to change how Californians live. Case in point: Army latrines, not high-speed rail. Critics say those aren't the types of projects with lasting effects on the economy. "Whether it's talking about building a new [military] hospital or bachelor's quarters, there isn't that return on investment that you'd find on something that increases efficiency like a road or transit project," said Ellis of Taxpayers for Common Sense. Job creation is another question. A recent survey by the Associated General Contractors of America found that slightly more than one-third of the companies awarded stimulus projects planned to hire new employees. But about one-third of the companies that weren't awarded stimulus projects also planned to hire new employees. "While the construction portion of the stimulus is having an impact, it is far from delivering its full promise and potential," said Stephen E. Sandherr, chief executive of the contractors group. It's unclear how many jobs will be created through the Defense Department projects. Most of the construction jobs are awarded through multiple award contracts, in which the department guarantees a minimum amount of business to certain contractors, and lets only those contractors bid on projects. Our advice to the Obama team would be to create and nurture a fiscal backdrop that tackles this jobs crisis with some permanent solutions rather than recurring populist short-term fiscal goodies that are only inducing households to add to their burdensome debt loads with no long-term multiplier impacts. The problem is not that we have an insufficient number of vehicles on the road or homes on the market; the problem is that we have insufficient labour demand. It's almost as if the administration is opting for a rose-colored-glasses PR strategy rather than taking a hard-nose look at actual consumer and employment figures and their trends, and modifying its economic policies accordingly. In reality, the entire debate regarding more-versus-less stimulus misses the mark. As painful as it is to think about, the Fed's policies - like those of the Treasury, White House and Congress - have been geared towards redistributing wealth upwards. See this, this, this, this, this and this. Update: An economist and the vice president of the St. Louis Federal Reserve says that quantitative easing may increase unemployment.